Acoustic Mobile Vocal Booth, Voice Over MObile recording studio in Action! VOMO Tour Videos. In Atlanta Georgia we were invited to a local High School to help find a solution for doing Voice over for their Video/Audio class. Currently they were trying to refurbish a janitor;s closet into a vocal booth by sticking some foam to the walls. It did not work too well. We presented the AVB33 – Acoustic Vocal Booth 3 x 3, that delivered great sound right there in the Video room. In this video we also quickly touch on WHY do you need to have your room acoustically treated. 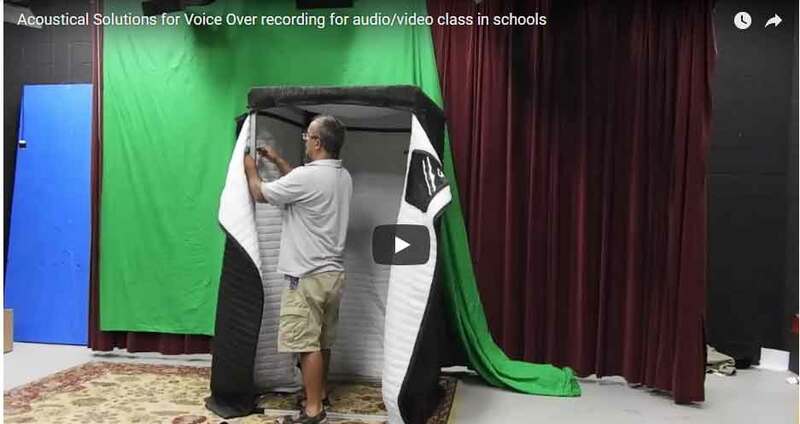 This entry was posted in Acoustic Mobile Vocal Booth, Voice Over MObile recording studio in Action! VOMO Tour Videos. and tagged acoustic room treatment, audio class, audio recording, audio recordingin high school, audio-video class in high school, Carry-on vocal booth, Most efficient portable vocal booth, portable vocal booth, school voice over, sound booth, video class, vocal booth, Vocal booth portable, voice acting, voice over, voice over recording while travelling, voice over travel, VOMO tour.